GOD LOVES you and He wants you to experience Peace and Life... Abundant and Eternal. If you don't know Jesus Christ as your Saviour, please, read on. We as humans do fail in our own eyes and before God... we need help. It are our sins which make division between us and God. We need a Mediator to get in touch with God. People around us fail and we get disappointed, even in ourselves. You may have problems, due to sin you cannot overcome. You're lacking strength and power to live a victorious life. You have looked everywhere for an answer, you're at the end of your rope and don't know where to turn to. Dear friend, I know these feelings of despair so well. But, I found the Secret, A Pearl of great value. If your heart is aching and you think there's no hope for you, just wait! I would like to introduce you to a very SPECIAL person, One who never fails, nor disappoints. His name is Jesus Christ. He died for your sins and shortcomings, so you may have peace with the Father and have Eternal Life. Let me show you some of God's Word. 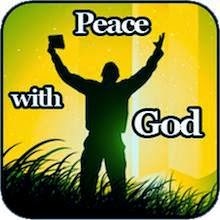 Romans 5:1... We have peace with God through our Lord Christ. John 3:16... God so Loved the world, that He gave His only begotten Son, that whosoever believeth in Him should not perish, but have everlasting life. How come most people are not experiencing peace and the abundant life, if God has planned it for us? We are created after God's image. He did not make us as robots to automatically love and obey Him. God gave us a will and freedom of choice. Romans 3:23... We all have sinned, and come short of the glory of God. Romans 6:23... The wages of sin is death (separation from God); but the gift of God is eternal life through Jesus Christ our Lord. Man has tried to bridge this gap by doing good works; becoming religious; making sacrifices without success. There is only one remedy for this separation. Jesus Christ is the mediator between God and man. 1Timothy 2:5...There is one God and one Mediator between God and men, the man Jesus Christ. Romans 5:8... But God commendeth (showed) His Love toward us, in that, while we were yet sinners, Christ died for us. John 14:6... Jesus said unto him, I am the way, the truth, and the life: no man comes to the Father, but by me. Ephesians 2:8,9... It is by grace you are saved through faith; and that not of yourselves; it is the gift of God: not of works, lest any man should boast. We read in the Bible, that God has provided the ONLY way... and we have to make the choice. We must personally accept Jesus Christ in our lives and declare Him Lord over All we are and have. Revelation 3:20... Behold, I stand at the door, and knock: If any man hear my voice, and open the door, I will come in to him. John 1:12... But as many as received Him, to them gave He power to become the sons of God, even to them that believe on His name. Romans 10:9...That if you confess with your mouth, Jesus is Lord, and believe with your heart that God raised Him from the dead, you will be saved. Admit that you are a sinner and you need a Saviour. Be willing to turn from your sinful ways and repent. Pray and invite Jesus Christ to come in and take control of your life. I know that I am a sinner and I am asking Your forgiveness. I want to trust You as my Saviour and follow You as my Lord. Thank You Lord for providing salvation for me. O Lord, help me to walk in Your ways and to be obedient to Your Word, I ask. I thank You now for eternal life which I received through faith in Jesus Christ. Teach me, and fill me with Your Holy Spirit and guide me through this life. Hold my hand, dear Jesus, so I won't go astray. Glorify Your name through my walk with You, I pray. Romans 10:13... Whosoever shall call upon the name of the Lord shall be saved!! 1 John 5:12,13... He that has the Son has Life; and he that has not the Son of God has not Life. These things have I written to you that you believe on the name of the Son of God; that you may know that you have Eternal Life, and that you may believe on the name of the Son of God. My friend, if you have prayed the above prayer or similar, you now have the power to become a child of God. He is now your Father, through faith in your Saviour, Jesus Christ. I am happy for you, because this brings you in a complete new avenue of life. You are now connected with the One Who will and can carry you through difficult times. You can trust Him and He will guide you. Just don't stop here. There are many helpful writings on my website, go back to the The Contents Page and you will find many links of helpful writings. Read your Bible daily; Talk to the Lord in prayer, and tell Him whatever is on your heart; Tell others about your new found "Treasure"; Find good Christian fellowship; a place where you have an opportunity to grow in FAITH. You may also contact me through the Guestbook (at the right side) or use the contact form at the bottom area. If you have any questions, or if you would like to talk to someone, I would love to hear from you. God bless you! Have a wonderful day ! This kind of "PEACE" is ALL you ever need!